We were a little surprised to find out Rising Storm 2: Vietnam, which was announced last year at E3, would be playable here on the PAX East 2016 show floor. Tom Marks and I hopped on for a couple rounds earlier today, crouching and crawling around as American and North Vietnamese soldiers in a mode that isn't quite the Red Orchestra or Rising Storm we're used to: small team competitive point capture. I was disappointed I didn't get to charge a machine gun nest with a team of 32 players, but in retrospect, a smaller mode is better suited for a quick demo at a crowded convention. I'm not fearful of any dramatic shift in priorities for Rising Storm 2: it feels very much like its predecessors—quick deaths, detailed gun handling, and careful movement all intact—except with more automatic guns. The classic modes and big maps (bigger, even) will return, though we didn't get to see them. 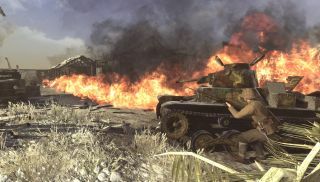 Tripwire also won't elaborate on whether or not Red Orchestra's vehicle combat is returning. Helicopters? We must know about them. Are they a call-in strike like artillery or something we can really pilot or ride in? We'll have to wait for those answers. In the meantime, there's still plenty to talk about. Watch the video above to see what I could learn in a quick interview with Rising Storm 2 director and lead programmer Sturt Jeffery. Also watch Tripwire and Antimatter's presentation from the PC Gamer Weekender for more detail on what Vietnam brings to the series. We'll check in again with the devs at PAX to bug them about helicopters some more.